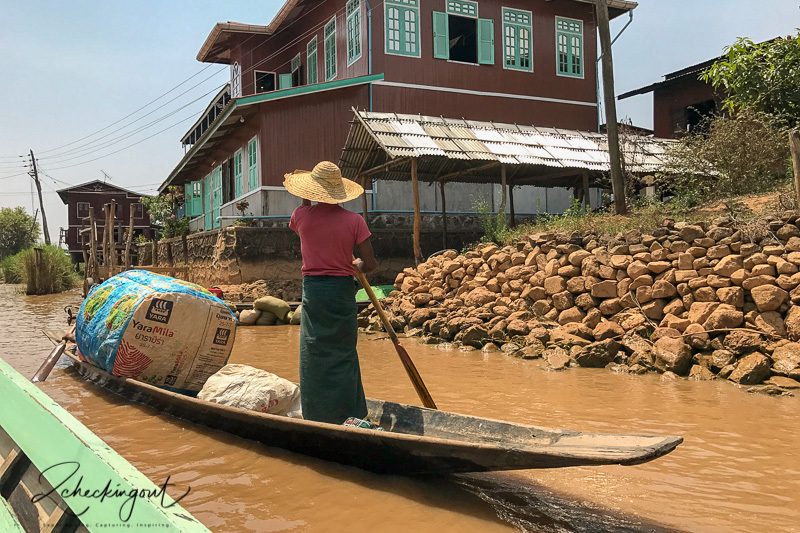 A Guide to Visting Myanmar (Part 3): Slow Train to Inle Lake — 2checkingout | travel and adventure | Inspiring. Capturing. Experiencing. The public bus coughed and sputtered its way north from Bagan to Mandalay. We were the only white faces for the five-hour journey. Surprised looks greeted us every time somebody new hopped on board. Why weren’t these crazy gringos taking the tourist VIP bus? Our last week saw us head to some of the top Myanmar destinations. From Mandalay to Inle Lake, followed by chill time at one of the best beaches in Myanmar, Ngapoli Beach. I’m sure there are some beautiful parts to Mandalay and a handful of must-visit locations but...we were dead tired, and a little out of sorts. So we spent 48 hours grabbing train tickets, sleeping, and catching up on a couple of episodes of The Walking Dead. Yes, I know we could watch TV anywhere and at any time. But sometimes when travelling long term you hit the wall, and this was one of those moments. As the afternoon train pulled out of Mandalay station, we settled in for the long haul. The journey to our next destination (Inle Lake) was at snail's pace and involved an overnight stay in Thazi. But first, a 4-hour train trip to reach this two-horse town. One horse to ferry you from the train station to the centre and another to take you back again. Not that you need a horse and cart (unless you are travelling Imelda Marcos style) as the centre is a two-minute walk. Thazi reminds us of an old western style staging town. The kind where tumbleweed rolls through, where strangers are greeted with a steely stare, and trigger fingers get twitchy. Far too many John Wayne movies as a kid. The accommodation options can be counted on two fingers. Literally. There’s Moonlight Guest House or Wonderful Guest House. Both miss the world’s top ten hotels by a country mile. But it’s all part of the Myanmar experience, and we are so glad we had a chance to take it all in. Having strolled both sides of the main street, we went in search of food. Being vegetarian can sometimes be challenging in remote locations. But we were wooed by one restaurant owner who assured us that his menu came with veggie options. It did and was surprisedly tasty, aided by a couple of Myanmar Beers. Climbing out of bed early we took the quick walk to the station to make to sure that we secured first class seats for the 10-hour ride. There’s no automatic ticket machines, no online booking; this is really old school. Escorted onto the platform and to the Station Manager’s office, our tickets were handwritten, and our names entered into a ledger the size of the Magna Carta. Sitting opposite us was a young German couple. No sooner had the train pulled out than the guy whisked out a screwdriver and set to work fixing his permanently reclined seat. He was soon in hot demand as other passengers (mostly locals) called upon his excellent fix-it skills. The narrow gauge train gently rocked along, passing lush green fields, dry open plains before chugging its way uphill. During the climb we made several switchbacks, staff jumping out and pulling enormous levers to switch the track. Forwards and backwards, the train zigzagged over the hill. Not saying we were moving along slowly but I’m sure I saw a snail overtake us at one point. Stopping at remote villages, traders swamped the train selling food, some identifiable, some not. All with the friendly Myanmarese smile we had come to know and love. This train journey is an epic way to experience life in some of the more remote parts of Myanmar. Gazing out of the window at the hand to mouth existence certainly makes you stop and think about how lucky and spoilt we are. Of course, you could skip the train and fly direct to the lake, but where is the experience in that? 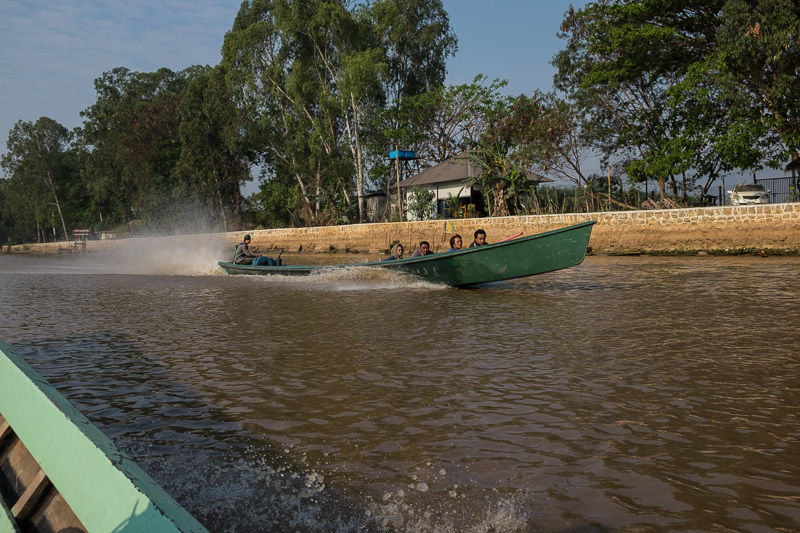 Pulling into the last stop, we jumped in the back of tuk-tuk for the 20-minute ride to the town of Nyaungshwe, our base for exploring Inle Lake. The 116 squared km (452 sq. miles) lake supports a thriving community and is also a hotspot for tourists, with the Inle Lake boat tour the number one must do activity. Boats of all shapes and sizes ply the lake. From super speedy long-tailed tourist boats to simple hollowed craft for ferrying goods around. At the far end of the lake, there are some key places to visit including floating villages, temples, and monasteries. There are also silversmiths and silk workshops to tempt you, and cheroot (small cigars) factories. We choose to skip the ‘show and buy’ options and headed straight for the temples. Zipping down various canals, passing houses on stilts. Workers up there necks in water picking rocks off the bottom. Weed gatherers used paddles to pull up piles of weed slowly. The weed is used to fertilise floating gardens. There’s also the famous fishermen that stand, using one leg to row their boat so that both hands are free to cast their net. The Nga Phe Kyaung monastery was infamous for its jumping cats. We understand that the cats are now retired from their performance days. The monastery is still worth a visit. The dark teak wood a stark contrast to the brilliantly coloured temples we are used to seeing. Shwe Indein Pagoda is at the southern edge of the lake with it’s covered walkway that turns into a craft and antique market. We arrived before there was any sign of life. Perfect for photos. Each side of the walkway are ruins of various pagodas and stupas. Some had been swallowed up by Mother Nature, some were undergoing restoration. All different colours and sizes. Towards the bottom end of the lake is the more significant Phaung Daw Oo Pagoda. The big draw here is the five small statues of Buddha which have been covered in gold leaf. The Buddhas are now unrecognisable and look like gold blobs (a future Dr Who character, me thinks). Only men are deemed worthy enough to apply the gold leaf, much to Julie’s annoyance. We organised our day on the lake through our digs, Aquarius Inn. A cute little place with a relaxing garden where they serve afternoon tea. How civilised. One afternoon as we drank tea in the garden, a parade passed by. Hundreds of men, women and children in local costumes taking part. The ladies were carrying ornaments festooned with money. The men banging drums and dancing as if at some trendy rave party. Unfortunately bringing up the rear of the parade was a sad looking elephant decorated from head to toe and perched atop, a young boy. The mahout walking alongside carrying a large bullhook. A real mood killer for these elephant lovers. We hired bikes and cycled part way around the lake. Paying the ferryman, we bundled our bikes onto a narrow boat to cross the lake. On the way back we found Red Mountain Estate vineyard and stopped for a tasting. Yuk, was the commonly used adjective. There’s still a long way to go for the wine industry in Myanmar. One of the funniest experiences of our time at Inle Lake was eating at Innlay Hut. A great little Indian curry house run by a guy (Nepalese/Bangladeshi) who models himself on Eminem. The first night a power cut delayed food arriving, but our host kept us entertained and supplied us with free beer. Returning two evenings later, we had yet another power cut. The owner remembered us and everything we had to eat on the previous visit. To top it off the food is delicious. Best food at Inle Lake and a great host. We did take an internal flight to our next destination, Ngapali Beach. The bus would take the best part of two days, and we wanted to maximise what time we had left. Again the booking system is not quite the modern, slick operation we are used to. Handwritten boarding passes and stickers to identify which flight we were on. The small plane pulled right up to the door of the terminal. Can’t fault the boarding, it took 10 minutes, tops. Compared to the rest of Myanmar, the accommodation, food and activities at Ngapali Beach are costly. We choose a budget hotel (air con only allowed on for a couple of hours a day) just a hundred metres back from the beach. For the most part, we had the place to ourselves but come the weekend it filled up rapidly with locals arriving for the start of the Thingyan Water Festival. Ngapali Beach is a series of white sandy bays with fishing villages dotted along the road that runs just behind the beaches. The lure of the unspoilt beaches has seen large hotel chains moving in including the likes of The Hilton. There’s very little to do other than soak up the sun, swim, eat and drink. A perfect location to unwind after a couple of weeks of travelling. I did manage to find the local market, which once again was filled with sights and smells that send the senses into overload. It’s one of my favourite places to photograph. Once you get over the fact that you’re the only white face around, markets are a great insight into local life. Thingyan is the Buddhist New Year festival and runs for three to four days. Once the religious aspects of the festival have been observed, it turns into a riot involving water. At Ngapali Beach, large platforms (pandals) sponsored by hotels or beer companies sprang up. Hoses with spray gun attachments are installed just waiting for the fun to begin. Nobody is safe from a soaking, be that scooter riders, tourist laden tuk tuks, or anybody daring to walk by. Young and old alike. We were chased by a couple of locals kids with buckets. We felt it only fair to let them have a little bit of fun. Back in Yangon for a night, flatbed trucks crowded with locals pulled alongside the pandals and exchanging buckets of water, while those on the platforms took aim with the hoses. Friends, Sam and Shaun always choose this time to take a holiday from their teaching jobs in Yangon. Things can get a little raucous, and the incidents of sexual assault go through the roof. More people die from drunken scooter accidents during Thingyan than any other time of year. Our time in this fascinating country flew by. The people we met, the towns and villages we visited, the sights we saw, made us fall in love with Myanmar. Myanmar has so much to offer to those travelling long-term or those looking for a two week getaway with a difference. Warm, genuine smiles greeted us everywhere we ventured. Helping hands worked hard to make sure that we enjoyed our time. We cannot be ignorant of the fact that there is ethnic cleansing to the north and cocktails and sunsets to the south. Myanmar is very much a military-led country, sitting behind the facade of Government that is powerless to invoke change. However, you do get the feeling that some change is in the air and it is fuelled, in part, by the increasing number of visitors to this South East Asian gem. But with increased tourism, comes the risk that the charm that Myanmar offers today may diminish as it has in other South East Asian countries. Only time will tell. Mandalay - Hotel Kaung Myint NZ$28.50 (US$19.50) included breakfast and ensuite, pretty central, clean and tidy. Thazi - Moonlight Guest House NZ$20.75 (US$14.25) ensuite, very basic. May have gone through an update since we stayed. Inle Lake - Aquarius Inn - NZ$29 (US$20) included breakfast and ensuite, excellent hospitality, served afternoon tea every day. One of best places we stayed in Myanmar. Ngapoli Beach - Vicinity Manor Ngapali Motel - NZ$86 (US$59), price included breakfast (pretty basic) and ensuite, ground floor room with small outdoor sitting area. Staff not too helpful, but it was one of the cheapest around. Mandalay - Central Park NZ$14.35 (US$10) a very western style restaurant, pizzas and burgers, had a friendly vibe to it. Inle Lake - Innlay Hut - NZ$11.50 (US$8). Loved this place and the owner, great food. Inle Lake - Pancake Kingdom - NZ$7.25 (US$5) So so, wanted something different, very quiet on the night we were there. Ngapoli Beach - Maison de Mare - NZ16 (US$11) On the main road, 2-minute walk from the hotel, seafood is excellent. Ngapoli Beach - Two Brothers - NZ18 (US$12) Gets excellent Tripadvisor reviews, but we have eaten better. Ngapoli Beach - Sunset View Beach Bar & Restaurant- NZ17 (US$11.50) Wonderful spot on the beach, we shared a whole baked fish and watched the sunset. Inle Lake, Red Mountain Estate Vineyard - Wine tasting NZ$11.50 (US$8). The wine is below average, but the views and experience are worth it. Inle Lake - 5-hour boat trip NZ$41.50 (US$28.50). Organised by the lovely lady at Aquarius Inn. Ngapoli Beach - 1 eScooter Hire NZ$12.50 (US$8.50 ) for the day. Twice the price of the Bagan, but gave us the ability to visit one or two other beaches and an inland temple. In total, we set a budget for two of NZ$80 (US$59) per day. We ended coming in at NZ$100 (US$74).125% to budget.